I was traveling to Argentina a lot in the early 2000s. The country was in ruins. And as I explained yesterday, that experience taught me something important... After all those visits, I know what a good starting point feels like, down in my toes. Times were tough in Argentina back then. But those tough times created a fantastic starting point for investors... It was a great opportunity to buy in cheap and make potentially huge returns. So what does our starting point look like in the U.S. today? At the bottom of the crisis in Argentina, money was hard to come by. And the country's benchmark stock index had fallen 90% from its highs. It's easy to see that the U.S. today is NOT Argentina in 2002. • Money is easy to come by in the U.S. Interest rates are low, and every banker wants to lend you money. • The stock market isn't down 90% at all... Instead, U.S. stocks have not had a losing year in the past nine years (when you include dividends). You might be shocked to hear this, but based on our starting point, U.S. stocks may deliver no return – or even a negative return – for the next decade or even longer. I said U.S. stocks have been up for nine years in a row. This has happened only once in the past century. The only other time stocks went up nine years in a row was during the 1990s. The returns were massive... at first. But it ended badly – with the dot-com bust. The Nasdaq Composite Index lost 80% of its value from peak to trough. If you bought right at the dot-com peak, it would have taken you 14 years to break even. U.S. stocks also had eight consecutive winning years (a similar time frame) during the Roaring Twenties... Then, the Great Depression hit. And stocks lost money in nine out of the next 13 years. If your starting point for buying U.S. stocks was the peak in 1929, then you wouldn't have broken even until 1946, based on the S&P 500 Index. My point is, your starting point for investing matters. And in the stock market today, our starting point is not good. In the bond market, it's not good either... The U.S. government will pay you less than 3% interest if you lend it money for 10 years. Does that sound like a good long-term deal to you? Using his seven-year forecasts for U.S. stocks and bonds, you're looking at a real return of negative 3.6% per year over the next seven years in a 60/40 portfolio (60% stocks and 40% bonds). This is one of the most basic portfolio allocations that investors can use. The typical mainstream investing advice is that "you can't know the future, and a 60/40 portfolio is what has performed well in the past." It's true – typically, a 60/40 mix of stocks and bonds has delivered an 8%-plus return over history. But the problem is the starting point... That's why Grantham expects a negative return for the next seven years. This negative 3.6% return isn't based on unreasonable assumptions, either. Grantham only assumes "reversion to the mean" – that is, valuations returning to normal. Are you willing to accept 14 to 17 years of no return on stocks, like we saw after the peaks in 1929 or 2000? We are pretty darn close to a bad starting point now. Negative 3.6% a year doesn't sound good to me. • Keep riding the "Melt Up" for another 18 months – at least. • Then, shift gears completely and get more conservative. • Invest in alternatives to traditional stocks and bonds. This is similar to what I did in the early 2000s. U.S. stocks were a bad deal, so I found ideas like gold coins and investments in Argentina. Today's starting point is beginning to look bad... So we have to shift our thinking in the years to come. Importantly, we're not there yet. The Melt Up isn't over. There's still money to be made in U.S. stocks. Just know that someday soon, you'll need to make a major shift in your investments. If not, our poor starting point could mean years of losses for your portfolio. Yesterday, Steve discussed the Argentina crisis of the 2000s – and what it can teach us as investors. "Anyone who invested in Argentina after the crisis bottomed should have made a fortune in a short period of time," he writes. Read more here. One of Steve's favorite strategies is to wait for a truly extraordinary starting point – a "fat pitch." It might take years to find one. But if you "swing the bat" when the moment is right, you can make incredible gains. Learn more here. NetApp uses storage devices and other solutions to help its customers save, manage, and protect their data. That includes clients like tech giants Microsoft, Google, and Amazon. 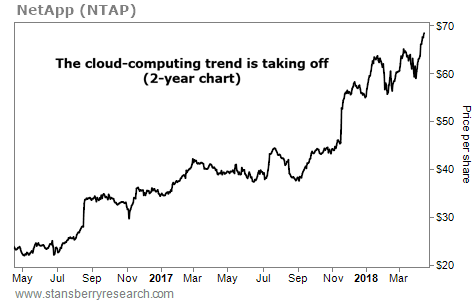 NetApp's outlook is bright... Earlier this month, management announced it expects annual growth of 15% over the next three years. The company also promised to double its annual dividend and approved a $4 billion share-buyback plan.